Tex-Mex Coleslaw - Home. Made. Interest. Thank you to Litehouse for sponsoring this post. All opinions are 100% our own. 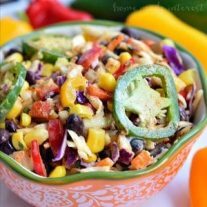 This Tex-Mex Coleslaw recipe spices up your usual coleslaw for a summer side dish full of southwest flavors! Move over boring sides there is a new coleslaw in town. I got a little crazy over the weekend and threw together all of my favorite southwest flavors to make this Tex-Mex Coleslaw. 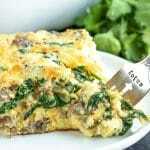 It is a bright, fresh, summer side dish that totally blows the usual summer BBQ sides away. I make no secret about the fact that I love Tex-Mex flavors. Chili powder, cumin, black beans, corn, all types of pepper from mild to hot. These ingredients make their way into my cooking all year long. There is nothing I like more than a dish with a little kick and some ranch dressing to dip it in, or to add to it, to help cool it down. When I was making sides to go along with a dinner cooked on the grill my guy requested coleslaw. I wasn’t that excited because the typical coleslaw isn’t really my thing. 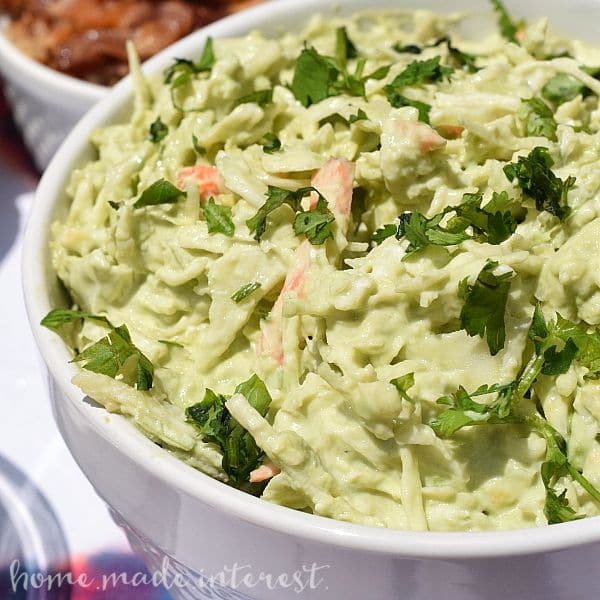 I’ve made avocado coleslaw in the past and it was really good but I wanted something with more color and more of those flavors I love so much. From that this tasty Tex-Mex Coleslaw was born. So many bold flavors packed into one fresh, crisp, and colorful side dish! Corn, black beans, bell peppers, jalapenos, chili powder, cumin, and to bind it all together Litehouse Homestyle Ranch. Just any old ranch dressing isn’t going to do for this recipe, you want something fresh, and creamy that is going to bring all of those southwest flavors together. I take my ranch dressing pretty seriously and I like Litehouse dressings because they are as real as the vegetables you’re putting them on. I didn’t really think about the preservatives in those bottles that keep them on the shelf for so long until I started cooking for myself. Litehouse dressings are found near the produce in the refrigerated section of your grocery store and they are a better, more delicious way to dress your veggies, because real food deserves real dressing. 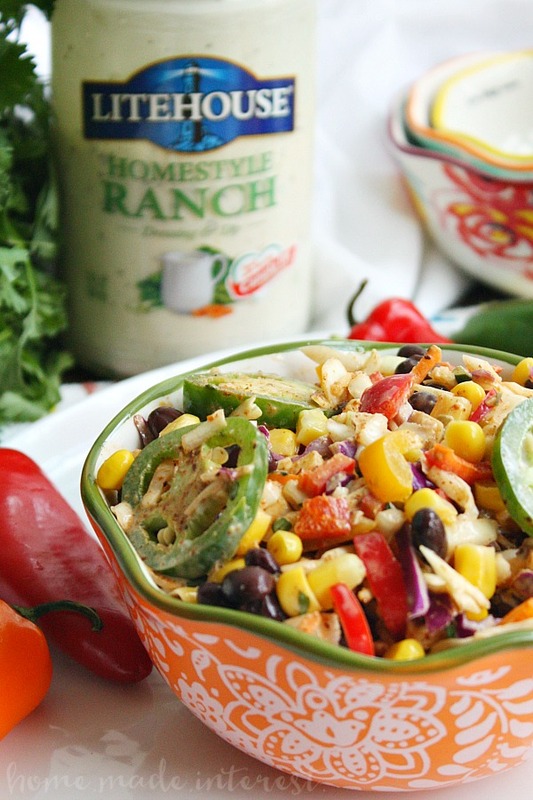 That creamy Litehouse Homestyle Ranch is poured over all of those bright, colorful, crisp, fresh vegetables and spices, and everything is tossed until it is lightly coated. Add a little fresh cilantro to finish it off and you have a coleslaw that is going to blow people’s minds! I think I’m going to make this again for my family reunion this weekend! This southwest inspired coleslaw has all of the Tex-Mex flavors you love, chili, cumin, black beans, corn, and don’t forget the ranch dressing! Pour Litehouse Homestyle Ranch, chili powder, and cumin over the coleslaw mixture. Make something real, with something real. Look for Litehouse Homestyle Ranch and Chunky Bleu Cheese dressings in the refrigerated section of your local supermarket.